Well, I can definitely smell fall in the air. Makes me want to get all my cosy sweaters, leggings, tall boots and chai pumpkin tea out. It really is my favourite season, cool, sunny and not too hot. As promised I thought I’d catch you up on some design projects that I worked on this past winter/spring. 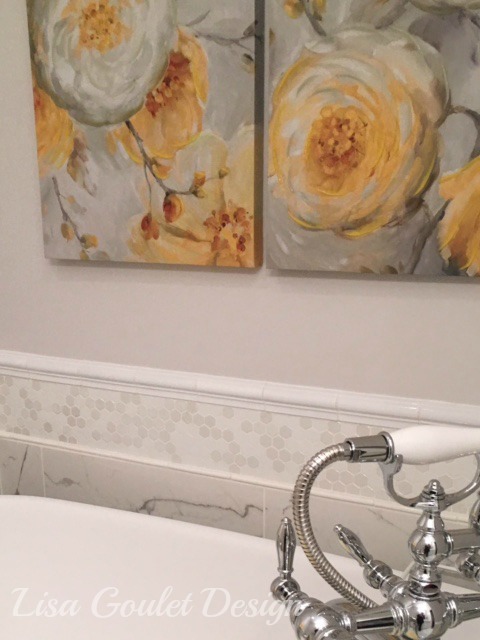 And this master bath renovation definitely brings to mind a fresh, bright, spring day. Quite a bit of work has been done on this client’s home, as the previous owner used a wheelchair and there was some retrofitting that needed to be done for my client. High up on the wish list, was her dark, brown and dreary master bathroom. Here’s the befores and I apologize for the absolutely terrible before pics. In my defence, it’s a small bath so it is very hard to get some good pictures but I think I accidentally deleted a few that actually were better than theses (shakes head). 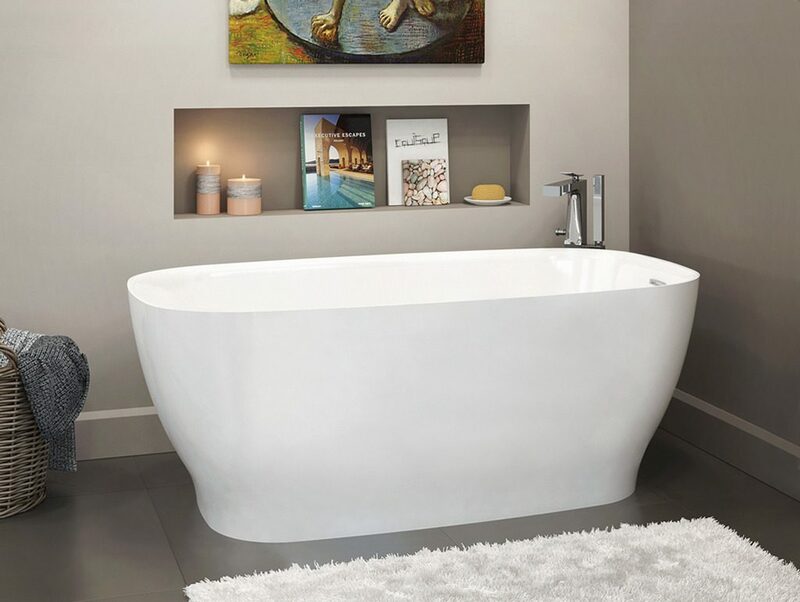 My client explained that she really wanted a white, clean, spare, spa bath with a freestanding tub and no shower (there’s one in the basement). 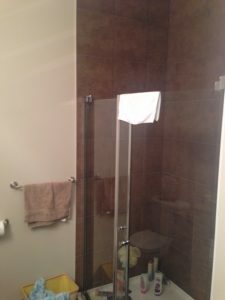 So, first up was removing the large brown walk-in shower. 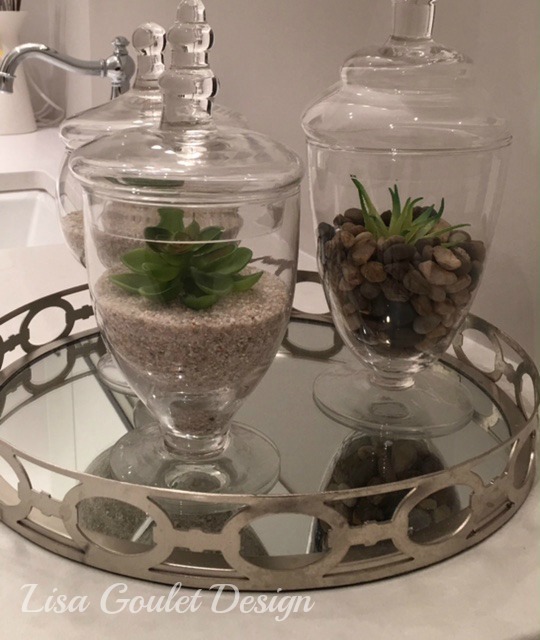 I gave my client the exact measurements she’d need for a tub that would fit into small alcove (where the shower had been) and she was off shopping. It was very important that she tried out the tub herself and made sure it was comfortable for her, tubs are like mattresses and seating, everyone fits in them differently. And happily, she found the perfect one, modern, clean, oval and exactly the right size for our space. Now it was time to find tiles. 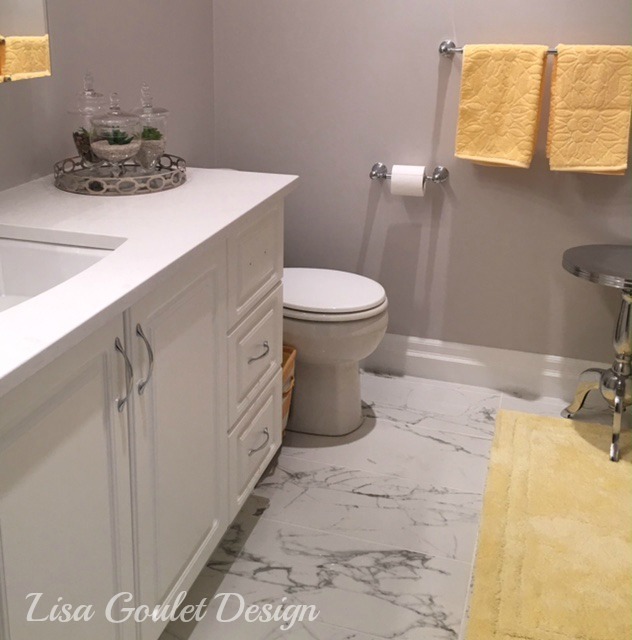 She loved the look of marble but with budget being an issue, I found some marble lookalike, large scale porcelain tile which fit the look and budget perfectly. We used them on the floor and then ran them up the wall about a third of the way, but just around the tub. 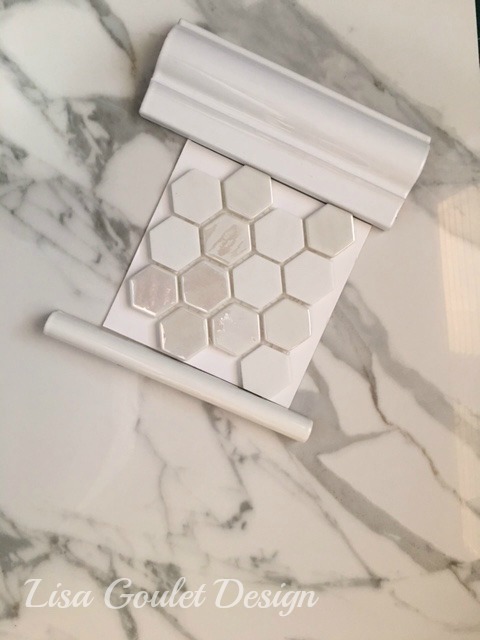 When I came upon this pretty matte and iridescence mini hexagon tile border, I had an aha moment. However, the large scale tile and the border tile were different thicknesses, but after adding in the chair rail moulding tile and pencil tile, it will never be noticed. 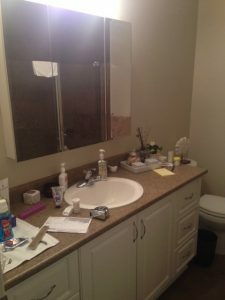 Due to budget constraints we decided to keep the existing white vanity. But upgraded to a new Caesarstone’s Organic White quartz countertop (above). 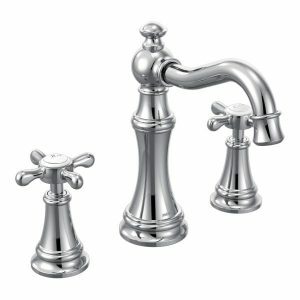 Together with a simple white square undermount sink, shiny new Moen faucets and hardware you’d never guess it was the same cabinet. Feminine and sparkly! 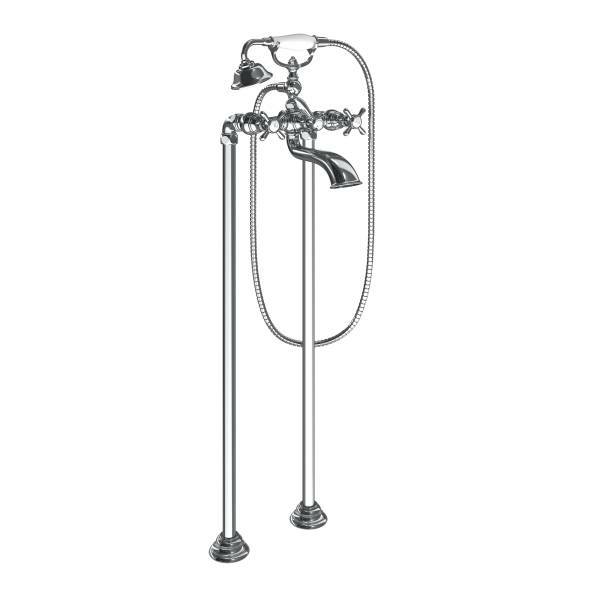 We added the matching two handle tub filer from Moen, which really makes a statement in the small bath. Again, excuse the photos, I haven’t had it professionally photographed yet, or even photographed by me properly, but here’s a few iPhone pics of the after. And yes we were still waiting for the new handles to be installed in this pic as well as for a small shelf above the toilet. Quite a difference from the previous space, wouldn’t you say? Bright and pretty, it’s the perfect spot to enjoy a nice soak.